Flex-free, firm-feel construction for zero energy loss. Lightweight, slim and elegant design ideally complements today's high-end, performance cycles. Specially created for road racing, time trialling, triathlon and serious mountain biking, whilst maintaining Rido's signature reduced pressure on the perineum. Rido R-Lt ... Buy It, Try It, Love Cycling Again!!! I bought this for my turbo trainer bike as I found other saddles uncomfortable and numbing now that I am spending more time on the turbo doing specific sessions. I have not yet ridden it for long enough to pass final judgement ... I think it is better than others I have tried as the ride position is slightly different and more suited to the static position on a turbo. Would I use it on a road bike? Probably not as my Selle Italias are all fine and lighter. Unlike the radical R2 saddle, this is much more conventional in looks. It is lightly padded but has a good shaped that raises you onto your "sit bones" so that your weight is carried correctly. It certainly works on my racing bike and I have no problems with spending 3 or 4 hours riding on it. Lightweight as well. However, it is rigid and does transmit the bumps in the road, so riding all day becomes a very harsh and sore business. This is the first Rido I have tried after they were highly recommended to me. It is beautifully light, but it is less padded than I expected. The weight distribution on the tender parts is a little better than my old & tired specialized road bike saddle, but it transmits a lot of road rattle. I definitely won't recommend this to my wife, but I will try an R2 sometime. After a couple of years enjoying an R2 on both my trusty race bike and work hybrid I was excited to hear of the Rlt's launch. I am a quad/triathlete who has always regarded cycling as the hard discipline, primarily because long endurance work has always come second to a propensity for strength and conditioning. As a solid built athlete a race bike has always seemed part razor blade to me and anything I can do to make it go faster is at the forefront of my thoughts. First impressions were that the Rlt was very much a traditional looking race saddle and I was concerned that the cushioning would be too light, having got so used to the luxury of the R2. After a number of rides I am getting the hang of the new beast. The Rlt is much more a bike racers saddle, as I found I could adjust my position over a longer ride, yet without having to put pressure anywhere delicate. The Rlt is an ingenious shape as it naturally encourages you back onto your sitting bones and I feel that I am generating more effort down through the cranks. It feels a solid riding position, although I have shortened my handle bar stem to adopt an optimum aero position, while feeling that better power generation, without any position shifting. On a few local regular local rides I have noticed a consistent increased average speed, despite maintaining my usual cadence on those routes. I feel I am wasting less energy and that is giving me an almost consistent 1mph improvement on regular rides. The lower profile of the Rlt means no chance of rubbing and the cushioning is deceptively good considering the lack of bulk. It is for this reason I opted to get a second Rlt for my hybrid, despite being perfectly happy with my R2. Clever design, improved riding performance and affordability make the Rlt my personal choice and I will continue to recommend RIDO saddles to those I coach and race with. I do mainly road cycling but am still not acclimatized to winters in Canada so for the next 45 months I will be biking on my trainer. So far the longest ride that I have done on the new saddle has been about 90 min and I simply could not believe the amazing lack of any pressure on my perineum after the ride. I just get off the bike and forget that I have been sitting on what should have been a very uncomfortable bike saddle. So, yes, so far it looks like it may be the best seat that I have ever had (even better than the previous large version of the Rido), though the true measure will be next spring when I start doing 45 hour rides again. I do know that every bikeshop should sell these saddles! The saddle sure is efficient in design, but, unfortunately, it is certainly not really for MTB use despite what the manufacturers have to say about it being for 'serious mountain biking' as well. Perhaps they assume that 'serious mountain bikers' won't be sitting most of the time. In a personal email, they said that it can be used for MTBs, but perhaps they meant, 'so long as you're not sitting in an upright position'. In another part of the Rido website, it is stated quite clearly that it is designed for the 'aero position'. Nice little contradiction. I suppose it could be used on an MTB if i was to replace the MTB handlebar with a racer handlebar. Waste of time and money in terms of the postage cost for sending it back. For the last 10yrs I've been riding an old specialized BG comfort, it was the only thing I could sit on due to having an injured pelvis (got ran over ! fractured my sacrum). All other saddles gave me a lot of pain and discomfort, I've tried dozens. This R Lt is helping me, I'm still adjusting to such a firm saddle, the old BG comfort was very soft. My coccyx is much more comfy but perineum is a bit tender still. Might have to play with the angle a bit. I did a 60mile ride today and don't feel too bad. I'm going to persist with this this one, most saddles I try get one outing and then get sent back, I now had about 6 rides on this one which seems promising ! It is a nice light saddle too. ConsWAY TOO narrow for me, def its a man's saddle. I had purchased the R2 Rido saddle for my Audax and long distance bicycle and LOVED this (read my review on that saddle). Then, purchased the R Lt for my 'posh' racer. HATED the R Lt version. I was swayed by the attractive appearance of the RLt, but as a women, its very narrow. Oh my... no... not for me folks. This is a man's saddle through and through. I returned the RLt to SJS who kindly exchanged for another R2, as usual fabulous service from SJS who personally replied to my emails to sort out my order . Much firmer than the R2 saddles that we have been using for about 2 years. The feel and pressure points are about the same and after the second ride, I was settling in on it. I think it will be very good after I become accustomed to the firmer feel. Certainly better than any conventional road saddle that I can remember. It looks very good. It will take several more rides to fully evaluate it, but so far I'm very happy with it. ProsLight, looks lovely and comfortable. This was the most interesting product that I have reviewd given it's importance. 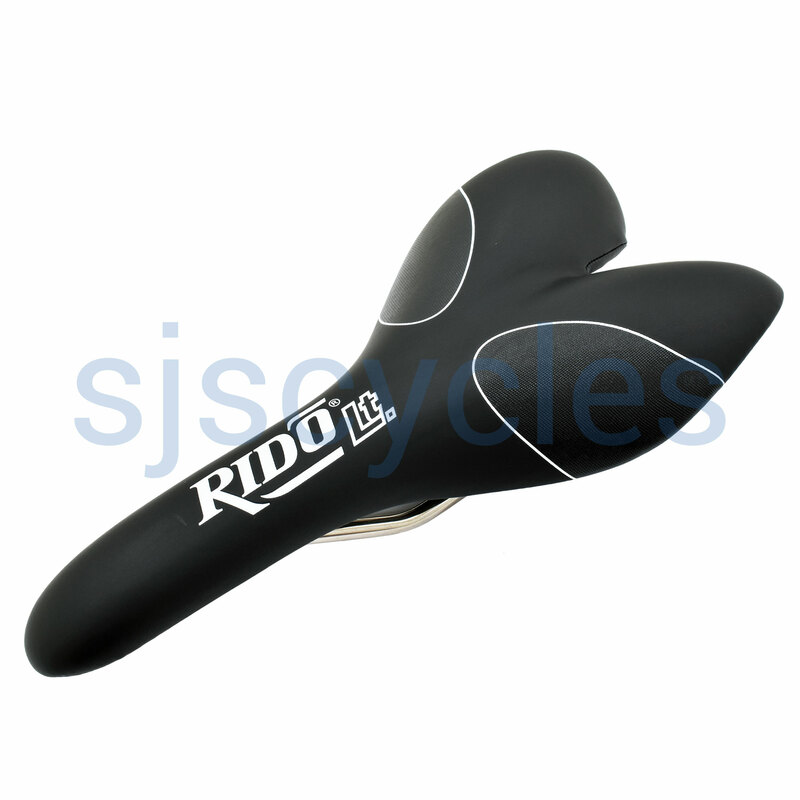 I previously had the Rido R2 which I thought was great and I wondered what this would be like. I was not sure at first, but have used it for nearly a week and I am pleasantly suprised. It is comfortable, and you have to sit back for it to be at its best. I think that I will prefer it to the R2 as time goes on. You have to be more careful with adjustments as it is not as bulky as the R2. Looks nice too and is lighter. So I am going to give 5/5. If you were a femail, I wonder if it would be wide enough though? I don't know. Recommend for a man. For a shipping quote just add all of the items you're looking at to your basket and the website will calculate the shipping costs for you.